Commentary: Where Are You, Cigar Lounges? Winter is coming. For those who don’t relish braving the harsh outdoor elements, the season is a stark reminder of the scarcity of indoor locales in which to enjoy a fine cigar. Government-imposed smoking bans have outlawed many bars, restaurants, and other establishments from offering cigar-friendly accommodations. In certain municipalities, private residences in multi-unit buildings have even been targeted. The result? In the winter, a multitude of cigar smokers must either curtail their cigar consumption until the weather improves; smoke out in the cold; build some kind of cigar sanctuary at their home, if possible; or find a welcoming cigar lounge, however far away. The latter can be surprisingly challenging. Depending on your region, your options may be extremely limited. My work-related travels regularly take me far away from my cozy den. 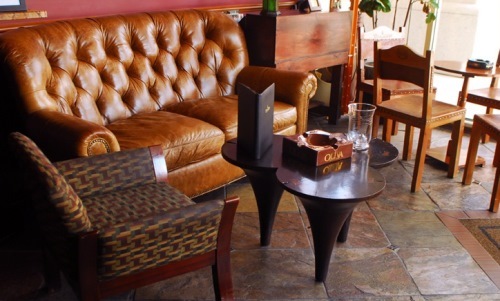 When they do—especially in the winter—I’m confronted with the same challenge: How do I find a convenient, well-appointed lounge where I can fire up a good smoke? I’ve written before about some of my criteria for optimal cigar enjoyment, as well as how to spot a good lounge/tobacconist. Generally, I’m looking for a welcoming environment with plenty of space, a good selection of cigars at fair prices, and the ability to enjoy an adult beverage with my cigar (either purchased at the lounge, or BYOB). Sometimes, depending on where I am, I’ll need to drive 30 to 60 minutes or more just to find a suitable spot. A good example: Last week I was in Hartford, Connecticut—the sort of city that has plenty of business travelers (think insurance and finance) for whom a cigar lounge would be a wonderful refuge after a day full of meetings. Sadly, the only cigar shop in town closes early and doesn’t have much space. So I find myself having to drive to New Haven to visit The Owl Shop (which is a lot of fun, by the way). In other instances, I’ll find myself near an upscale, members-only cigar lounge where my only option would be to pay a $50 entrance fee. I’ve never actually done this, mind you, since I can’t reconcile having to pay $50 for the right to buy a smoke and sit in a chair. True, some places have great cigar lounges (I’m looking at you, Cigar Masters in Providence, Rhode Island). But with premium cigar consumption—and bourbon consumption—on the upswing, I’m still amazed at how hard it can be to locate a suitable lounge in some areas. And it seems like every good lounge I visit is always packed with people paying good money for premium cocktails and higher-priced cigars. The good news? Thanks to mobile technology, social media, etc. it’s easier than ever to find the nearest smoke-friendly option. It’s just unfortunate the “nearest” often isn’t all that near. What are some of the best apps/websites out there for finding cigar-friendly locations? One suggestion: Phone ahead to check on hours, smoking setup, etc., on any shop you find in a database. Situations can change quickly and render information incorrect. I just returned from Vegas on business, and had a chance to visit Casa Fuentes in The Forum Shops at Caesar's. Apparently they recently remodeled, and the place is very nice, but only if you Fuente cigars, which I found to be quite nice. However, the best place I found was at my hotel, the Mirage (right next door). A place called Rhumbar. It was midweek, so very few people. They have a humidor, a bar, and the outside area has cushioned, patio-type wicker seating for at least 100, with big screen tvs everywhere. I sat, feet up on a table, directly in front of a television watching MNF (Carolina stunk it up), and Mirage's erupting volcano going off in the background, burning a couple of sticks and enjoying a couple of margaritas. There were maybe 6 or 8 people there including me. This was my vision of heaven on earth for a couple of hours. I recommend it now that Vegas is going into their off-season. You weren't looking hard enough within 10 minutes you could have been at a number of lounges that stay open till ten or 11, even one that routinely is open till midnight and beyond. Do you have any examples to share?I tried to crowd-source for this information via social media, and the response was I should head to New Haven for The Owl Shop. By the way, I think The Owl Shop was worth the drive. Also remember local laws may make finding a cigar lounge difficult. And in some areas, BYOB is technically illegal. But I always scout that kind of info out before any trip.